This plant was registered by Paul Aden of New York in 1978 as a hybrid of H. 'Yellow Splash' and a seedling of H. 'Fortunei Robusta'. According to The Hostapedia by Mark Zilis (2009), "...its heritage is certainly H. sieboldii." The plant forms a medium size (16 inches high by 36 inches wide) mound of streaked foliage. Its leaves are rounded at the base, slightly wavy and have average substance. From late July into August, it bears medium purple colored flowers followed by viable seeds. According to The Hostapedia by Mark Zilis (2009), this cultivar "...has yielded an incredible number of variegated seedlings as well as a few sports. It frequently stabilizes to the green-centered, creamy margined form, 'Neat Splash Rim'." The New Encyclopedia of Hostas by Diana Grenfell (2009) states: "Among the first streaked hostas used in breeding and an excellent parent for variegated offspring...Very unstable variegation, the leaves often having large patches of green with no streaking." An article by Warren I. Pollock in The Hosta Journal (1998 Vol. 29 No. 1) states that, "...I'm told there are nurseries that list H. 'Neat Splash' but actually sell and ship H. 'Neat Splash Rim'..."
Pollock continued, "Don Stevens was a retired school teacher in the Boston area, noted for his hybridization of daylilies...he thought he would try his hand with hostas. Needing seeds and knowing of Mildred Seaver...he purchased the H. 'Neat Splash' seeds from her...After germinating them and growing them on for a while, he...asked her to grow on the hosta ones. She did. Not long afterward in 1983, Don Stevens died. Of the H. 'Neat Splash' lot, she selected the best and named it for him." 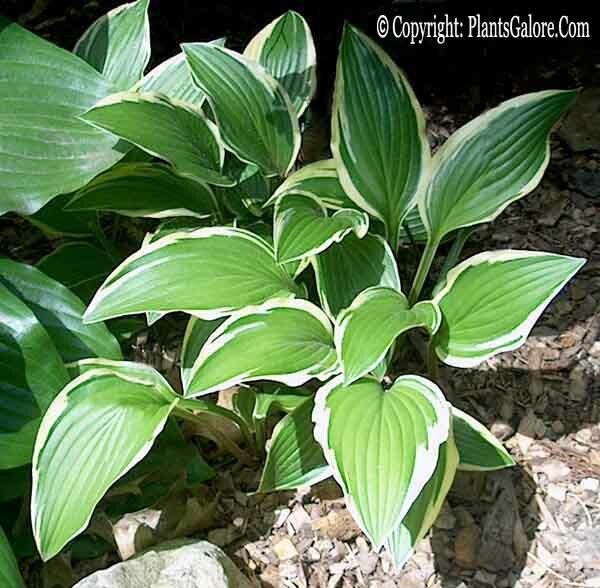 The original plant was streaked but it soon settled into a hosta with a yellow marginal variegation.